Acting on another of those rumours, I call Bob Mckeage at International Yacht Collection, joint central agent for sale of the 47.5m superyacht MITseaAH, and he confirms that she's had another reduction in price, this time by $1 million. 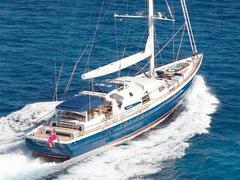 For sale with Kevin Merrigan at Northrop & Johnson, this all-aluminium motorsailer was launched by Pendennis in 2004. Built to ABS class and MCA compliant, MITseaAH accommodates 10 guests in a master, three doubles and a twin and cruises at 22 knots and her new asking price is $18.9 million.